Image works with SD cards and USB drives. Regular firmware in the device is NOT CHANGED. Option how to start (Activation multi-boot). Now all images Armbian and LE has all the files for activate the multi-boot. Anything in addition to download and copy to media is not required. 8. System will reboot twice and start running the system from external media. 9. If after 7-10 minutes on the monitor not to receive any messages on system startup. Turn off TV box and manual copy into the first partition BOOT (FAT) the file "dtb.img". On the media there is a directory "dtb" from where you can take the file and copy it to the root of /boot rename it to "dtb.img". Need to pick up the option for the file system will run. Pay attention, after you add\change the dtb file, you need to try to run the system and waiting to run 7-10 minutes. If not happened, repeat with a different dtb file. Attention !!!! On models with S802 S805 S812. Activation multi-boot is possible ONLY with SD card (activation of the USB stick is NOT WORKING). After a one-time activation procedure is multi-boot, run a variety of systems is possible from ANY storage media (SD cards and USB storage devices). The choice of shell to start (Mate\XFCE or KODI). On the screen enter username and password (in lightdm) in the upper right corner of the screen there is a menu where you choose which GUI to run. The list will be three items (two rows with kodi) and the last line mate. 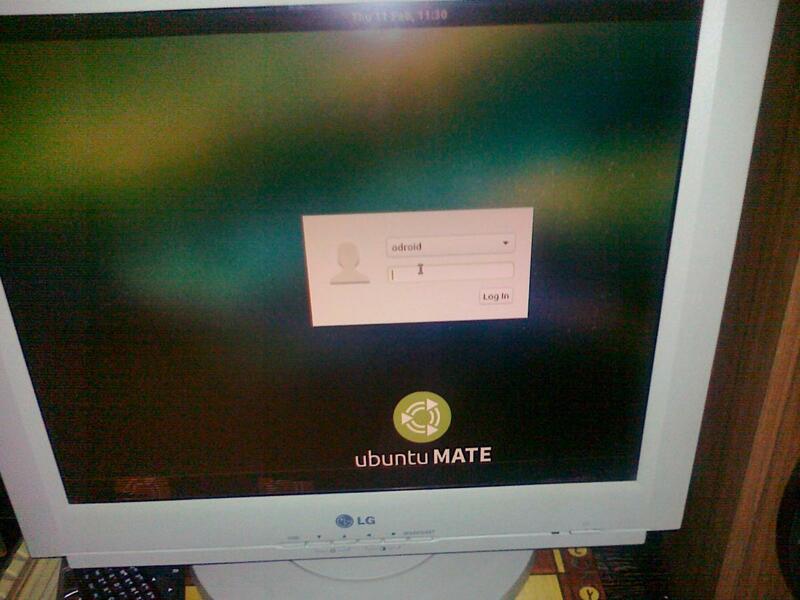 Select mate (something opposite mate was the point), then enter the username and password. The system remembers the last selected mode. If at the next login or what not to choose in this menu, system at the entrance will trigger the option that was turning off in the previous session. Kernel 4.16 does not support internal﻿﻿ eMMC memory. Do not attempt to install to the eMMC. You get problems. To install Armbian in the internal memory, you must execute multiple commands. We strongly recommend TO PreRUN create a full backup of the entire contents of the internal memory. This will allow you to return to the current state of the firmware at any time. To create a complete backup you need to execute commands. Pay attention, if you not are sure that you will be able to solve possible problems from the installation of the internal memory (eMMC), do NOT PERFORM these commands. The configure script video output hdmi.sh reside in a directory on a FAT partition (on a running system, this partition is automatically mounted to the /boot directory). This script can be changed. To change the screen resolution from 720p to 1080p, you need to uncomment the line "#mode=1080p60hz" and comment out the line "mode=720p60hz". Similarly, you can change the color depth from the default 24 to 32 (bpp=24). Note that with 32 bit color significantly changes the desktop. In this script you can place the commands you want to run WebMin , Doker, ask line to run the USB port (if necessary), configure, sound card, etc. An example command to load module “dhd” or “wifi_dummy” or "ssv6051" or "wlan" etc. After verification of the selected module, if everything is working correctly, you can add it to the autorun list (add string name of the module in the file /etc/modules). How to add support for remote control. To use it you need to add the correct file “remote.conf” in the /boot directory or /etc/amremote. By default, some of the images already include several predefined files (in the /boot directory). To use it you need to rename one of the files in “remote.conf”. Additionally I have uploaded the deb package “amremote.deb”, which can be installed in your current system (do not download the complete image). After installing this package you need to run in a terminal “service amlogic-remotecfg status” and add (rename) the correct file 'remote.conf". Information to enable multi-boot on the WiKi is outdated, use to activate the multi-boot description from this post in the beginning. Other versions of images with different Linux systems. with the how-to from http://www.cnx-software.com/2015/12/06/how-to-run-headless-linux-on-amlogic-s905-devices-such-as-mini-mx-or-k1-plus/#it was possible to boot the Odroid C2 Image on a Mini M8S ( s905 2GB Ram). The Mini M8S stock u-boot does not support CFGLOAD, so I had to change some parameter from the boot.ini to bring them to the ENV. The Boot Priority is different from the Odroid C2, it will only check the EMMC, does someone knows if this is more a hardware or software configuration? If someone has interest I will post a small how-to. Thank you for your hard work for this open system. @tpc010 Please do, I bought this box precisely for this purpose. Thx @balbes150 for obviating the need for a USB/TTL cable! @Shimon, ok, it will take some days, I hope I have time on Weekend to create a HowTo. I'm about to convert my MXQ PRO+ to Linux, which needs just the standard, automated method. Is M8s mini much different? you have to open the case and search for the UART connectors, the Mini M8S has easy accessible connectors, I fond Mini MX III PCB pictures there is a really hidden UART Port, and I didn't find a PCB Image for the MXQ Pro+, so you have to search for it. @tpc010 Have you tried adapting the automated method of changing the boot procedure using Android's "Update&Backup"? According to one user it already works on MXQ PRO+. No, I uses the how-to from cnx-software, but at the moment the manual way, I will automate it and describe how to change the right things, so the Android will work and if you boot with a SD card it will boot from this. Important is, the cable have to be 3,3 Volt like for the raspberry pi, so I use a converter with an CP2102, this is 3,3 and 5V tolerant. 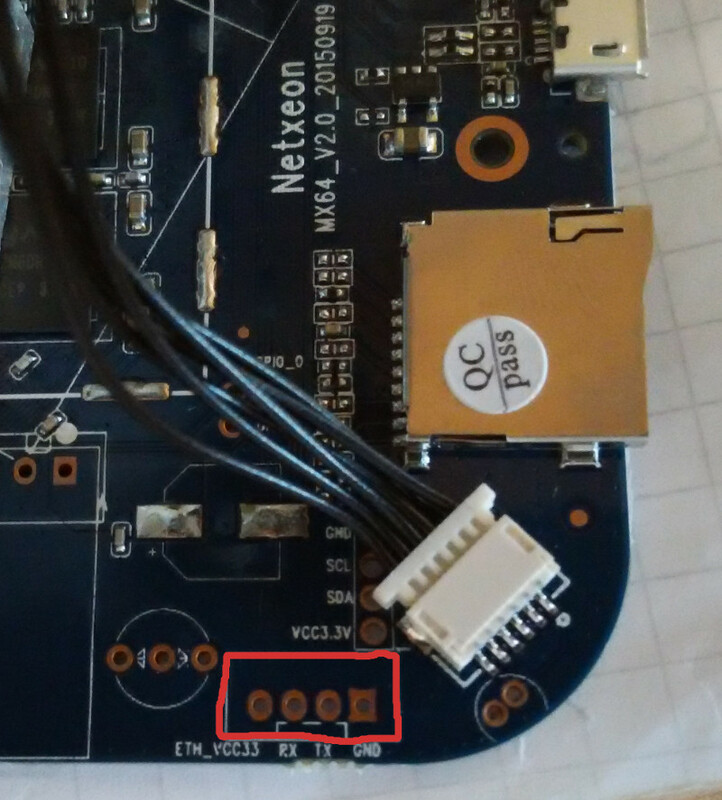 The Odroid UART Kit has a CP2104 with 1,8 to 3,3 Volt http://www.hardkernel.com/main/products/prdt_info.php?g_code=G134111883934. To enable multi-boot on any device platform Amlogic S905 to connect UART is not required. All operations can be done via a normal Update&Restore. The user manual can be found here. If your model is not, you need to use the universal variant. In C2 use your Odroid u-boot, which added to the boot.ini as a startup script. You can use another option that uses standard features of u-boot. The script for the command autoscr. Not a lot of details can be seen here. You can download it from https://github.com/150balbes/Amlogic_s905/tree/master/script/S905_UBOOT/s905_uboot its the same aml_autoscript as in yandex and the s905_uboot_multi_version_v2.zip contains the same aml_autoscript but in a update_uboot folder. Probably this will update the u-boot environment to enable to boot from the SD card for those firmwares who not allows it. If you prefer you can do this manualy from the u-boot console with the serial cable and setenv/saveenv commands (probably what @tpc010 means) or as suggested by @balbes150 use the "automatic" update procedure, don't know if this works for all firmwares. aml_autoscript and s905_autoscript are nothing more then a boot.scr (u-boot commands compiled with mkimage). Gradually began to create a universal configuration for assembling the images with the features of TV box for Amlogic S905. The first rough sketches can be viewed here. Corrected your message, because the answer is duplicated. I believe the Update&Backup procedure was successful on my MXQ Pro+, and it seems the device is trying to boot from SD or USB, but the image I used (Debian-Jessie64-1.0~RC2-2016-03-10-MXQPRO4K.img plus my own dtb) doesn't bring up anything on the screen. It probably stops booting after ca. 10 seconds (led stops flashing). Any suggestions of a different minimal image? (2G card) How do I set 1280x1024 DVI resolution like on my Odroid? As far as I remember, this way when you first start trying to enlarge the second partition and erase the boot loader. Use caution with the launch of this image. In order to test You multiboot or not, I recommend to take other images. What files are now on the first partition (the FAT partition) card ? Thanks for the suggestion @balbes150, I have been bitten by using USB port no.4 (otg) on MXQ PRO+. Using other ports and your own universal Ubuntu image without resizing the ext4 partition (16G card), having added an appropriate dtb.img file, it works! Done the same on M8S mini, changing the dtb file and it also seems to work. There's one snag, though. HDMI cable must NOT be connected during boot or my DVI/SXGA monitor never leaves low power mode. Is it a firmware problem? On my Odroid switching to HDMI mode produces broken picture but the monitor definitely switches on. Thanks so much, this is so great! The monitor is connected via DVI/HDMI adapter ? In Android, the monitor turns on normally ? I have several different consoles Amlogic S905. Several different adapter (VGA\HDMI not DVI) . Multiple monitors. Each connecting console\adapter\monitor everything works. Perhaps the reason for the peculiarities of the transition between the HDMI - to-DVI ? Definitely the problem is about HDMI -> DVI, but curiously, both Android systems boot just fine (incl. Google splash screen). Is there a way to implement VESA modes from odroid's boot.ini? At the moment, both in Android and Linux, 720p doesn't display correctly (ca. 1/4 of the screen lies outside of the visible area). What is your monitor model ? What resolution and refresh rate it supports ? If you need other boot parameters (different from those that are in the current file s905_autoscript). The settings are easy to change. Clone the git to select or create a new text file with the necessary set of commands (with extension txt). Make a new script s905_autoscript (it's a binary file). Copy the new file instead. It's an LG Flatron, 1280x1024 @ 60 Hz DVI/VGA monitor. I'll try replacing the script according to your suggestion and report back. Any idea if this resolution could be enabled for Android? I don't know Android. We can assume that Android is aimed at the TV settings. There is this screen resolution is not. You will need to get into codes video driver. I use computer translation. Sorry, I may not understand Your question. You asked about KODI. What he had in mind ? KODI works on Android. Is there a version of Openelec that you can run on MXQ PRO. Please specify what "docker", give the link.